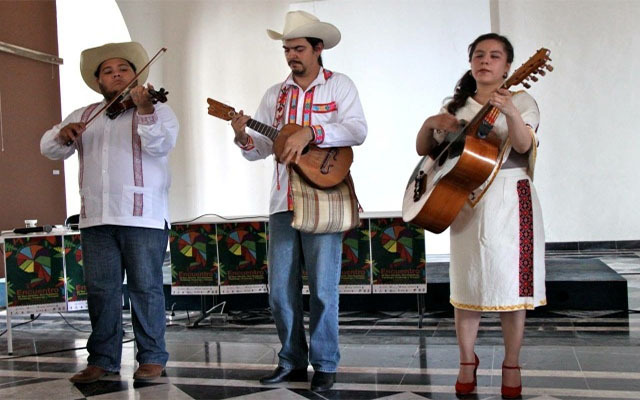 Tlacuatzin is a trio of remarkable Mexican musicians, who explore the profane and sacred music of the Huasteca. Their first foray abroad is a rare opportunity to experience an ancient repertoire seldom heard outside their region that includes mestizo huapangos, festive Day of the Dead airs, improvised verse and enchanting violin solos. They borrow their name from the mythological opossum which stole fire from the gods and gave it to humans. They liken themselves to this trickster in that they are able to steal smiles and dance from their audiences. Toronto has the good fortune of receiving them during the Day of the Dead, for concerts, a community celebration, a book launch and workshops. They will be introducing us to Xantolo, a regional variant of the Day of the Dead traditions celebrated in Veracruz, Hidalgo and San Luis Potosí. Each musician adds a specific and rich perspective to the group’s organic sound. Musical director Eloy Züniga, also know for his work with jazz/folk innovators La Manta, has developed an impressive approach to the jarana huasteca ( a 5 stringed guitar similar to a tenor ukelele) as a result of his training as a classical guitarist combined with his profound understanding of the traditional music of the Huasteca region. Young prodigy Manolo Zavala from El Higo, Veracruz is a remarkable violinist sought after to accompany traditional dance during Xantolo celebrations that begin on September 29th and culminate at the end of November. His passion for teaching has spurred a renaissance of son huasteco in the town of Tanquian, San Luis Potosí where he has taught weekly music classes to children in the town square for the past three years. Yuyutlztin Pérez, is leading female voice in a genre dominated until recently by male vocalists. She has played an important role in the resurgence of son huasteco in her hometown of Tepetzintla, Veracruz. Yuyu’s instrument, la quinta huapanguera, is large guitar found only in the huasteca region and her vigorous strumming grounds the ensemble in a syncopated and hypnotic groove. When not performing she is a historian. Tlacuatzin confirmed activities in Toronto from the 28th of October to the 14th of November. Lula Lounge, 1585 Dundas Street West. Monday, November 2: Pages Unbound Festival: Lotería Huasteca by Alec Dempster Book Launch and Concert at Gladstone Hotel Ballroom,1214 Queen St W.